Most experts would agree that a wet diet is better for dogs than dry kibble. While they can both offer a nutritionally balanced diet, wet food has higher water content. It's usually more nutrient dense, too. Petcurean NOW FRESH is taking their wet food game up a notch by offering a grain- and gluten-free food stored in sustainable packaging. Dry kibble is the most common diet fed to companion dogs, because it is convenient and inexpensive. While wet food offers the same convenience, it is almost always more expensive than it's dry counterpart. If you're considering a wet food diet to entice a picky eater or to add some moisture to your dog's dry dinner, you can use wet food as a topper instead of a full meal. This will cut down on the cost and add a little variety to Fido's food. Petcurean specializes in making premium pet foods that are formulated by their trusted team of veterinary nutritionists. If you're hoping to give NOW FRESH wet dog food a try, today is your lucky day! We're giving one lucky pet owner the chance to win 7 packages of NOW FRESH Wet Food for dogs for FREE! Visit this giveaway’s post and like it, leave a comment or share it. Remember that you MUST like our page in order to be eligible. We often have readers who comment on the post without liking the page, and unfortunately that will leave you ineligible for this giveaway and any future giveaways. Following these steps will automatically enter you to win free dog food, and we’ll contact you via Facebook if you’re the lucky winner. Don’t wait – the giveaway ends on April 15th, 2019! If you don’t win this time, don’t worry; we will announce another giveaway soon! You can check out our previous giveaways for pet owners to see what other products Top Dog Tips readers have won in the past. Don’t forget to bookmark the page and keep checking in for more giveaways of free dog products coming soon. Petcurean NOW FRESH wet dog food is formulated to meet the nutritional levels established by the Association of American Feed Control Officials Dog Food Nutrient Profiles for All Life Stages, including growth of large breeds weighing 70 pounds or more as an adult. 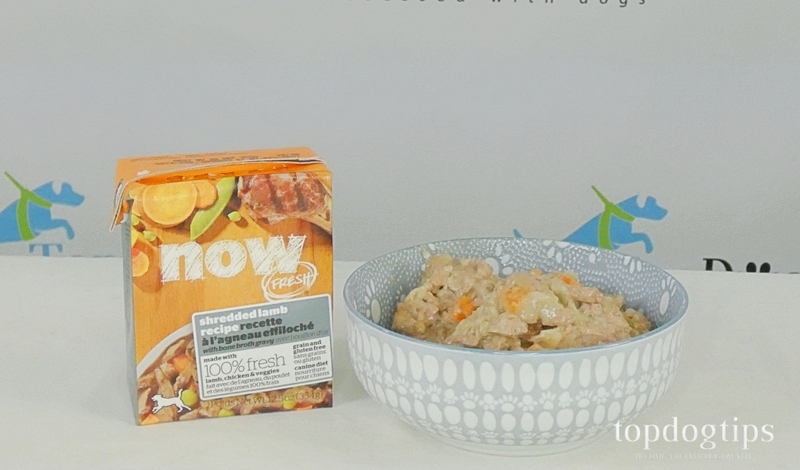 This dog food is made with non-GMO ingredients. All recipes are formulated with 100% fresh meat, potatoes, carrots, peas, cranberries, sweet potatoes, apples and bone broth. The recipes are also grain- and gluten-free. Not only does Petcurean pride themselves on offering premium quality pet food, they also have a commitment to sustainability. NOW FRESH wet food comes in a Tetra Pak carton that is sustainable and 100% recyclable. The container is reclosable, which is convenient if you're only planning to use it as a snack or food topper. Visit this giveaway’s post and comment/share. Doing this will automatically enter you into the giveaway for 7 packages of NOW FRESH Wet Dog Food from Petcurean. We’ll contact the winner via Facebook after the drawing. You also can subscribe to our newsletter below, for e-mail updates on upcoming giveaways and notifications about all of our new content. Do NOT miss any future FREE giveaways – SUBSCRIBE to our YouTube channel!